My Cliché of Choice – Where Is My Spot? I had a different post planned for today—a wandering post about the value of a writing partner. But Paul’s and Jodi’s posts of the past two days—as well as the fact that I couldn’t stop said post from wandering—have led me to this post in its stead. It’s important—perhaps even critical—for a writer to find a place that stimulates and nurtures his creativity. If you’re lucky enough you’re ideal spot will be at home. But Paul detailed the greatest threat to this set-up—the immediacy of the internet. Add to that a family, or the lack thereof, and the home office may be anything but creative. So where does one write? 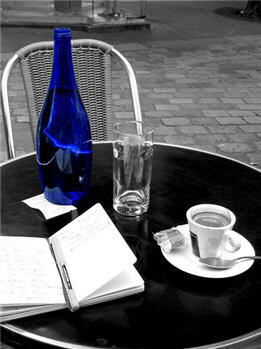 In a frightful nod to the cliché the best place for me to write has always been a café. The most creative times in my life have been spent inside cheap—inexpensive, not run-down—restaurants. The Wag’s (if you never had Wag’s in your area, it’s not far removed from a Denny’s) on Biscayne Boulevard, down the street from the University, saw an incredible number of late-night pencil-and-paper sessions. And not just creative sessions, but study sessions of all sorts. Open 24 Hours: Truth be told I could have cared less about the sunrise to sunset hours. But it was happily open for my mt creative hours. Busy: That is to say there was plenty of activity. A nice steady din is critical to a creative environment, and the groups of people coming and going allowed for plenty of people-watching and lent their quirks to more than a few characters. But Not too Busy: So I didn’t have to feel guilty for tying up a table for hours at a time, and I could always get a big table to spread out my papers and textbooks. Cheap Food: Dinner a drink and tip all for about $10. Good Air Conditioning: In Miami, when the dorms don’t have adequate air conditioning this is not a minor point. Waitresses: They were nice enough, kept the iced tea filled, and weren’t attractive enough to be distracting. I list these reasons (well…hopefully because it’s at least mildly amusing) not under any assumption that the reasons will apply to you, but because Jodi asked us what our ideal writing space would be. I don’t understand people who can write in a beautiful vacation spot. How Thoreau got any work at all done at Walden Pond baffles me. I’d spend my time sleeping in, hiking, maybe fishing…anything but working. But that’s me. My “café” wouldn’t be your ideal environment, and your writer’s retreat would be a terrible drain on my will to write. But both Paul and Jodi are correct It’s vital that you determine what you need to be creative, and that you find—or create—a place that fits your needs. Writers generally aren’t allowed many clichés, but we all have a few tucked away in a drawer somewhere. Writing in a café is one of mine.